Love Probiotics’ Raw Apple Cider Vinegar is a powerful cleansing and healing elixir that has a wide variety of internal as well as external benefits. 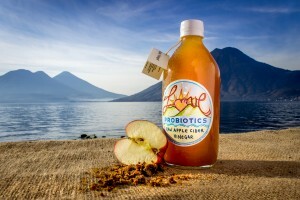 Raw apple cider vinegar is a live, unpasteurized product. A “vinegar mother” may form on the surface of your vinegar. This “mother” occurs naturally and is made from strand-like enzymes of protein molecules. It is safe to consume. Vinegar does not need refrigeration. If using vinegar topically, make sure to stay out of direct sunlight, or wash with soap and water before exposure.